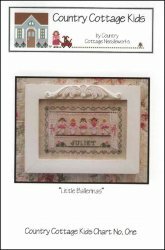 Little Ballerinas [C6603] - $8.50 : Yarn Tree, Your wholesale source for cross stitch supplies. Five ballerinas in pink tutus. A design especially for the little dancer in your life, with an alphabet included so that it can be personalized. Stitch count 121w x 73h.